Asthma attacks come with little warning and are often triggered by invisible particles in the air. Now, thanks to advances in Bluetooth technology, smartphones have become the newest weapon in the fight against asthma. Propeller Health, a Wisconsin-based company, wants to help those with respiratory problems by supplementing medicine with technology. The firm has wired an inhaler with a Bluetooth transmitter to communicate with an asthma patient’s smartphone. This sensor activates when the inhaler is pressed, setting into motion a process that records the exact time and location of a patient’s asthma attack on a smartphone app. Doctors can view this data and see, not only how frequently the patient suffers attacks, but also tease apart the environmental factors that caused the distress. 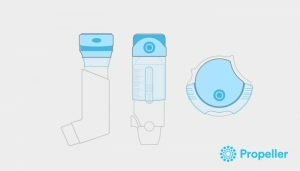 Smart inhalers are part of an emerging trend in medical technology known as “connected health.” Major tech firms have introduced ventures like Apple Health, a part of the iOS operating system that groups together biometric data recorded by apps and accessories. Meanwhile, medical equipment firms are installing internet connections on their devices, such as Continuous Positive Airway Pressure sleep machines, glucose meters and blood pressure monitors. 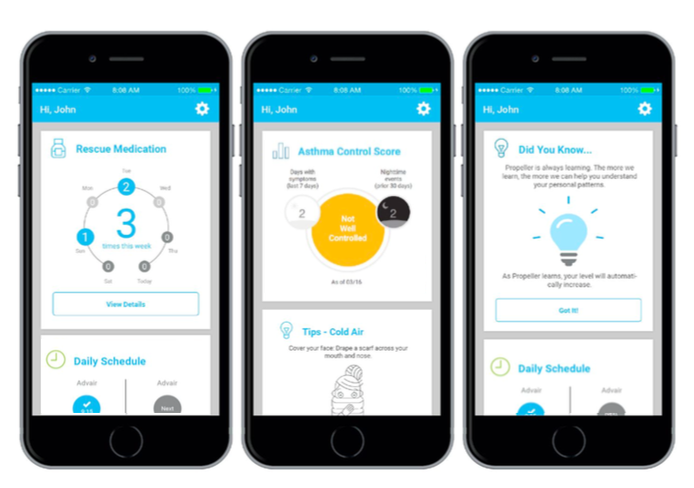 The Propeller sensor also sets out to manage medication schedules. On average, less than 50 percent of asthma patients take their medicine correctly, said Linda Neuhauser, a professor at University of California, Berkeley who researches asthma treatments. A study conducted by Propeller and Dignity Health, a California hospital system, found that asthma-related hospitalizations dropped from 1.9 to 0 among 330 patients who had attached the sensor to their inhaler during an 11-month period. These participants also experienced 60 percent fewer asthma-related ER visits. “They’re now making policy changes to improve emissions standards and clean the air, Hogg said. It’s not cheap though. A standard albuterol inhaler costs $5 to $60, while the Propeller sensor has a unit cost of approximately $300. And while most connected health devices can be easily purchased online, the Propeller sensor is only available through a handful of health plans and sponsors. It is typically prescribed by a doctor. Air quality monitors are another technological tool in the fight against asthma. One brand, Speck, has been used to research the causes of asthma attacks in the home. Special correspondent Cat Wise reports on a California program that tries to keep asthmatic kids healthy in the place where they spend most of their time: at home.